The Müritz Cruise will show you the diverse landscapes that north-eastern Germany has to offer. Along with little towns and villages with their typical flair, the holidaymaker will also be introduced to the region&apos;s exceptional diversity of flora and fauna. 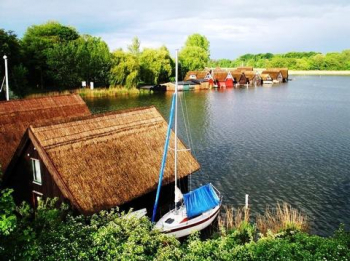 Mecklenburg-Vorpommern is home to the Mecklenburg lakes, one of which is the Müritz, which, with an area of 117 sq. km, is one of Germany&apos;s largest inland lakes. The best time for a Müritz Cruise is between May and September. The Müritz is divided into several smaller waterbodies and stretches of water. The northern bank of the Müritz is home to the climatic spa of Waren, which offers many opportunities for physical activity. These include several bathing beaches and a well-developed network of paths. The area around Waren also boasts various national parks. The town itself is home to the "Müritzeum" - a freshwater aquarium and multimedia exhibition on the Müritz region - which is worth seeing.
. The eastern shore of the Müritz borders the Müritz National Park, created in 1990. Over 100 lakes and smaller bodies of standing water are spread over the park&apos;s 318 sq. km, providing habitats for a broad diversity of flora and fauna. The "Kleine Müritz" is home to the parish of Rechlin, with its historical association with aeronautics, which is why we recommend a visit to the "Luftfahrttechnisches Museum". The classical church in north Rechlin is also worthy of mention. The western shore of the Müritz is home to Röbel with its well-preserved historic old town and impressive church of St. Mary. Other ports of call on the banks of the Müritz and its neighbouring lakes are Plau, with numerous interesting buildings and monuments, and Malchin, with impressive remains of the town&apos;s original fortifications. Relax in the heart of a green landscape. Allow yourself to drift on a lake in the midst of a fascinating nature conservation area.